You can be adopted as a JEW spiritually by accepting YAH’S SALVATION (which includes HIS BLOOD Sacrifice) and afterwards start living like a biological JEW hence a Spiritual Jew. You have to be ready to forsake all your pagan customs and observations then start following YAH’S a.k.a ELOHIM’S customs!!! You can be washed by YAHUSHUA’S BLOOD which is JEWISH/HEBREW/ISRAELI from all your wrong-doing, that is a.k.a sin!!! The Old Covenant/Testament makes it clear that there are YAHudim/JEWS and there are GOYIM/GENTILES. The New Covenant/Testament also points this out. However the New Covenant UNITES JEW/YAHudah and GENTILE/GOY!!! The JEWS (in Hebrew: YAHUDIM) were and still are SET APART people of YAH a.k.a ELOHIM (a.k.a GOD). They have strict and loving guidelines they follow which make them very special. The specific Special Guidelines make them CLEAN both SPIRITUALLY and PHYSICALLY before YAH Almighty! In Moshe’s/Moses’ time, one could be adopted thereby becoming one of and one with ISRAEL by agreeing to be circumcised if male and follow the YAH-given customs. As per the Orthodox Jewish customs, today, one can be adopted physically as a JEW and therefore ISRAELITE by going through a process of CONVERSION which can be 3 to 5 years as there is so much to learn including the Hebrew language. Gentiles in the Hebrew language are called GOYIM! The Gentiles were and are regarded as YAH’S people but not specially chosen and set apart. In fact, they were seen as pagans or heathens. They did not follow YAH’S TORAH as a way of life. They had and some still gods and they made all kinds of sacrifices unto them including human beings!!! They also ate and still eat unclean foods (non-kosher a.k.a non-kashrut). They were therefore deemed UNCLEAN both SPIRITUALLY and PHYSICALLY!!! They were looked down upon by the JEWS. 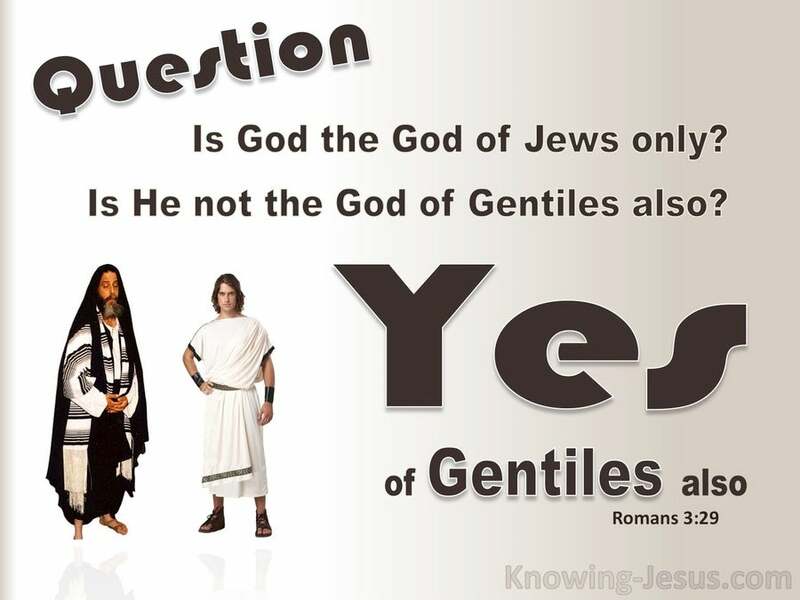 So, with this understanding, why would one accept YAH’S SALVATION which is of JEWISH descent and still prefer to be called a Gentile (in Hebrew: Goy)? ABBA YAHUVEH (a.k.a YAHWEH), YAHUSHUA HA MASHIACH (a.k.a JESUS CHRIST/YESHUA) and SHKINYINYAH GLORY (a.k.a RUACH HA KODESH/HOLY SPIRIT) have revealed through their AMIGHTYWIND that anyone who accepts HIM as their only personal LORD and SAVIOUR or MASHIACH/MESSIAH is automatically adopted by ABBA YAHUVEH as a (Spiritual) Jew and Israelite. The Spiritual supersede the natural/physical/earthly. Romans 11 and Revelation 2 makes it clear that a true JEW is one who has accepted YAH’S SALVATION! It also says that the DOOR OF YAH’S SALVATION WAS OPENED TO THE GENTILES WHEN THE BIOLOGICAL JEWS REJECTED YAH’S SALVATION!!! Gentiles can now become Spiritual Jews thereby living like Biological Jews would as instructed by YAH through HIS TORAH!!! The Gentiles can become SPIRITUALLY and PHYSICALLY CLEAN by accepting YAH’S SALVATION and changing their lifestyles. YAHUSHUA’S Apostle Peter was the FIRST to reach out to the Gentiles as instructed by YAH through a vision. See the Book of Acts. His fellow Jewish/Israelite Apostles did not agree with and/or support him in doing so when he opened up to them about the revelation he had received from YAH! In fact, there was a dispute amongst them. Everyone went their separate ways. THAT was where the reaching out to the Goyim/Gentiles all started after YAHUSHUA’S Ascension to the Heavens. Apostle Shaul/Paul also reached out to the Goyim/Gentiles. For years, it has been taught and believed in a misguided way that there are JEWS and there are Gentiles in YAHUSHUA HA MASHIACH (a.k.a JESUS CHRIST/YESHUA) since Christianity was formed thereby separating YAH’S SALVATION from its Jewish/Israeli/Hebrew Roots. However, YAH Almighty is correcting this through various Ministries including Amightywind Ministry. The JEWS and Gentiles are becoming united spiritually in YAHUSHUA HA MASHIACH!!! The sooner you understand your real identity in YAHUSHUA, the better your life will become. You will gain much better understanding of YAH and HIS plan for your life!!! HIS WORD will come alive in a very different way!!! You will arise and shine like never before as per Yeshayahu/Isaiah 60! We need to keep praying and spreading the good news with YAH’S WISDOM. Note that WISDOM = RUACH HA KODESH/HOLY SPIRIT as per Proverbs 8 and John 14. 2 You were once dead because of your failures and sins. 2 You followed the ways of this present world and its spiritual ruler. This ruler continues to work in people who refuse to obey God. 3 All of us once lived among these people, and followed the desires of our corrupt nature. We did what our corrupt desires and thoughts wanted us to do. So, because of our nature, we deserved God’s anger just like everyone else.2 You followed the ways of this present world and its spiritual ruler. This ruler continues to work in people who refuse to obey God. 3 All of us once lived among these people, and followed the desires of our corrupt nature. We did what our corrupt desires and thoughts wanted us to do. So, because of our nature, we deserved God’s anger just like everyone else. 4 But God is rich in mercy because of his great love for us. 5 We were dead because of our failures, but he made us alive together with Christ. (It is God’s kindness[a] that saved you.) 6 God has brought us back to life together with Christ Yeshua and has given us a position in heaven with him. 7 He did this through Christ Yeshua out of his generosity to us in order to show his extremely rich kindness in the world to come. 8 God saved you through faith as an act of kindness. You had nothing to do with it. Being saved is a gift from God. 9 It’s not the result of anything you’ve done, so no one can brag about it. 10 God has made us what we are. He has created us in Christ Yeshua to live lives filled with good works that he has prepared for us to do. 11 Remember that once you were not Jewish physically. Those who called themselves “the circumcised” because of what they had done to their bodies called you “the uncircumcised.” 12 Also, at that time you were without Christ. You were excluded from citizenship in Israel, and the pledges[b] God made in his promise were foreign to you. You had no hope and were in the world without God. 13 But now through Christ Yeshua you, who were once far away, have been brought near by the blood of Christ. 14 So he is our peace. In his body he has made Jewish and non-Jewish people one by breaking down the wall of hostility that kept them apart. 15 He brought an end to the commandments and demands found in Moses’ Teachings so that he could take Jewish and non-Jewish people and create one new humanity in himself. So he made peace. 16 He also brought them back to God in one body by his cross, on which he killed the hostility. 17 He came with the Good News of peace for you who were far away and for those who were near. 18 So Jewish and non-Jewish people can go to the Father in one Spirit. 19 That is why you are no longer foreigners and outsiders but citizens together with God’s people and members of God’s family. 20 You are built on the foundation of the apostles and prophets. Christ Yeshua himself is the cornerstone. 21 In him all the parts of the building fit together and grow into a holy temple in the Lord. 22 Through him you, also, are being built in the Spirit together with others into a place where God lives.